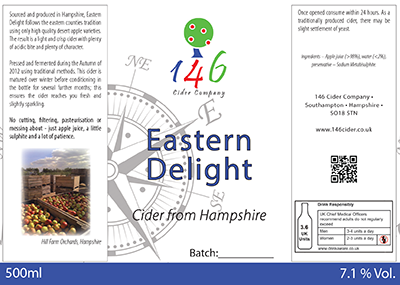 Eastern Delight follows the eastern style of cider. It is made from a broad range of quality desert apples. This cider is both lighter and more acidic than either of the other 146 ciders, with a light fruity taste and a good kick of acid - very refreshing on a hot summers day. Being made from purely desert fruit, there is very little tannin to offset the sharpness and the mild flavour comes about from aging the cider in bulk. A popular cider in the South, Eastern Delight won 'Cider of the Festival' at Southampton Beer Festival 2012 as well as 'Gold Medal Cider' at the Winchester Beer and Cider Festival in March 2013. All the apples (100% heritage desert fruit) comes from Hampshire; both from the Fruitwise orchards and also from Hill Farm - both near to Southampton. The cider was pressed from October 2012 - January 2013 and fermented in bulk, using wild yeasts for fermentation.